Last Saturday, as I was heading down to my hotel’s fitness centre, I got a call from Steve Prue. 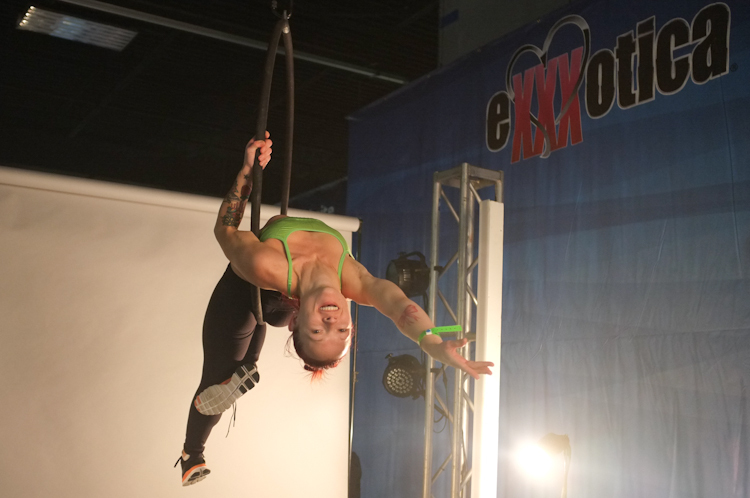 Steve was over at the New Jersey Convention Centre shooting Digital Playground star, and aerialist extraordinaire, Stoya, for next years EXXXOTICA series. Stoya’s Lyra had to be lowered for the shoot, so they needed some supplies brought over from her hotel room. I arranged for the needed items, and ran over the the expo hall. When I arrived, Stoya was still in make-up, so I went on stage to assist Steve with set up. Since I was already dressed and warmed up for a work out of my own, I took the opportunity to do a few tricks up on Stoya’s hoop. As mentioned in my “Join The Circus” post, aerial work requires incredible core strength, and provides an abdominal work out like no other. Once the rigging was fixed, and the lights were properly set up, I headed back to the hotel to complete my workout. Well warmed up from my time on the hoop, I decided to continue with abdominal work, by doing this circuit three times through.